SoundMenu-Like GNOME Shell Extension: "Mediasplayers"
"Mediasplayers" is a new GNOME Shell extension created by WebUpd8 reader ycDref, for controlling Banshee, Clementine or Rhythmbox from the GNOME Shell top bar. The extension looks a lot like the Ubuntu Sound Menu and it displays the currently playing song, cover art and you can adjust the sound volume for the controlled music player, change tracks and more. 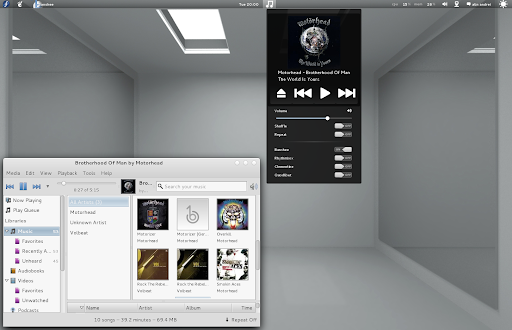 GNOME Shell Mediasplayers extension was initially designed for Banshee and it works great with it, but in my test it was a bit buggy with Clementine and Rhythmbox: the cover art is not displayed when using Rhythmbox and for both Clementine and Rhythmbox: when changing tracks from the application (not when using the extension to change tracks), the extension isn't updated. Also, the selected player is not saved and the extension reverts to Banshee after each restart. So this is a great extension if you use Banshee but it needs some fixes for other music players. Then, if you use Banshee, enable the MPRIS extension. And finally, reload GNOME Shell (ALT + F2 and enter "r" or log out). For a similar extension (but without cover art), see: GNOME Shell Mediaplayer extension. Update: the extension now supports Quodlibet too. Thanks to ycDref for the tip!